Visitors of Life see a table at an entire gallery space; this way everybody can have their own interpretation of life and its true meaning. You are taken off guard. This is the very first reaction art lovers show when they visit the final exhibition underway at Assar Art Gallery in Tehran this year [ending March 20, 2015]. Life, the only work on display at the gallery, is just one piece of conceptual art by Reza Lavasani. Life, which has occupied the whole gallery space, is simply a magnificent large table which narrates life from the artist’s perspective. Visitors have to walk around the table and watch the objects and creatures on it to grasp their own interpretation of Life. So it is quite natural that everyone will have their own interpretation of life depending on their experience. Plates, dishes and spoons as well as statuettes of a horse and a bird, a vase and candlesticks sit on a 17-meter L-shaped table with a huge chandelier hanging overhead. What is amazing is that all pieces of this artistic work have been made of papier-mâché [or paper mache, the French for “chewed paper” which is a composite material consisting of paper pieces or pulp, sometimes reinforced with textiles, bound with an adhesive, such as glue, starch, or wallpaper paste]. As for the papier-mâché installations, Maryam Majd, who is the Assar Art Gallery’s curator, said that it is a museum work and the Assar Gallery is to put it on display in different museums around the world. 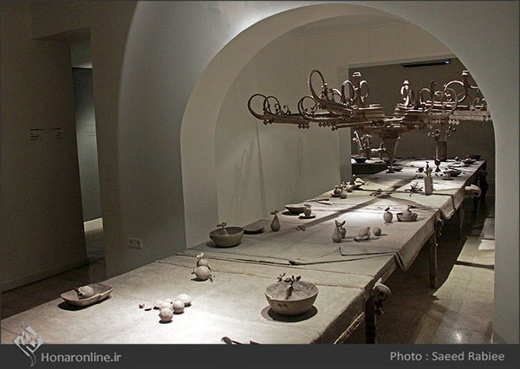 She further said that Reza Lavasani, who has won the first prize of [Tehran’s] 4th Biennial of Sculpture [and 6th Biennial of Illustration], has an artistic style of his own. She went on to say that Life has not been created instantaneously; rather, it is the result of a special look at the universe. That’s why it took Lavasani three years to create Life. Majd said that Life is a selection of Reza Lavasani’s life from the past to the present, saying it does not end at this point and his take on life goes on. “Looking at Life, we first see glory and grandeur, but a closer look reveals the ups and downs that lie ahead [for everyone] in life. We see tablecloths which have been crumpled, and finally we see a life which has been minimalized; it has become simplified. Technically, everything in Life is patchy – in other words, it is in pieces, like the life itself which exists in a piece and the other pieces are added to it.